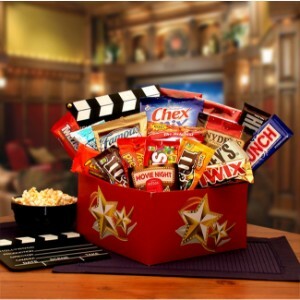 Make it a Red Box Night with this exciting new gift box featuring a Red Box Gift card good for 6 movie rentals and all the classic movie treats they could want for a fantastic night of movie fun. The It's A Red Box Night Gift Box w- Red Box Gift Card includes: Red Box movie gift card good for 6 movie rentals, Directors Cut board, Twizzlers licorice, Reese's peanut butter cups, Rice Krispie treat, plain M & M's, Peanut M & M's, Reese's Pieces, Twix Bar, Hershey's classic milk chocolate bar, Hershey's Cookies N cream bar, Nestle Crunch Bar, Snyder's Pretzels, Chex Mix, 2-butter flavor microwave popcorn, Famous Amos cookies, Cracker Jacks caramel corn with surprise. Comes complete inside a two tone gift box with hand made movie reel bow. Gift box measures 8x8x6 and is decorated with movie night graphics.